Triathlon Life! : The Road to Boston Runs through Columbus! I did it! 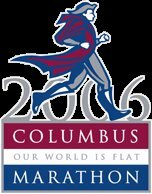 It has been 11 years since I ran my last marathon and I signed up today for the Columbus Ohio Marathon this October 15th 2006. 1. I have to fix my 3:30 finish time in Columbus 11 years ago to something better. 2. It is the road to the Boston marathon. If I finish the race under 3:30 I qualify to run Boston in 2007. I have to admit the inspiration came to me from listening to some rambling diatribes composed during distance long runs of an entertaining and educational goofy podcast shows of Phedippidations. Thank you Steve Runner of phedippidations for all the great shows that have made me laugh and even shed a tear. My eight year old son also enjoys listening to your show and wants me to tell him when a funny part of the show is on. My marathon dreams are to run the 3 big ones. Boston, New York, and Chicago. Then I may be ready for the big Ironman training plan. I think now is the time for me to get started. Maybe before I hit 50? woohoo, it's alway exciting to training for a particular race. You'll like Columbus, but it isn't pancake flat and don't let them tell you otherwise! Expect a slight incline from 15 on. You are so ready to crush that course. I may join you down there, but I won't make that decision till sometime after September 10. If I do run Columbus, want to shoot for 3:05 with me? ALLLLL Right!! Columbus is a fun race! You will do awesome! Thanks for the comment. I am looking at bringing 22 gel ;)..the whole bottle. There will be a lot of eating for sure. Way to commit to this beautiful race! I am sure you will speed through the course.